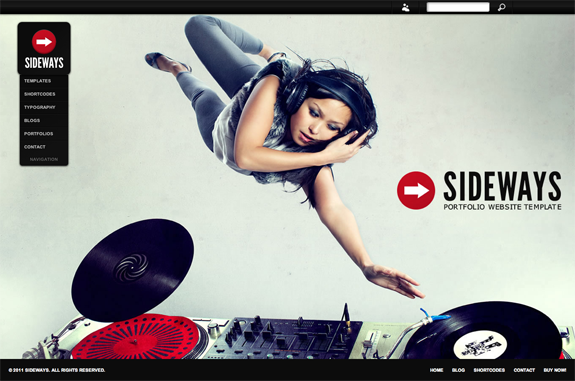 Sideways is a premium portfolio theme that offers both horizontal and grid layouts. It incorporates eye catching full screen background images that scale to fit all resolutions and window sizes as well as strong and elegant typography and design. Clean and simple navigation make using Sideways an incredible experience that your audience is sure to enjoy while taking in some of your most recent bodies of work. Keep your fanbase informed with this wonderful premium WordPress theme! Includes the new ‘Raw Options’ panel with an improved interface (including toggle switches and color picker) along with code optimization. 20+ shortcodes to help you jazz up your website’s content. Shortcode buttons are built into the WordPress visual editor. Template specific options are built into the page edit screen. Come back and check out the showcase as we find more sites from around the web using Sideways. Hi. Does the Sideways Premium WordPress Theme use hooks? Yes, the Sideways theme uses hooks.